Posted March 26, 2018 by Ellie Michell & filed under Cornish Ketchup, Fundraising, Gardening, News, People, Veg Bags. Hello and welcome to our annual newsletter. As the snow is thawing and we are enjoying some spring sunshine we thought we would send you an update of the exciting projects we are involved with. We have lots of plans for the year ahead including celebrating our 20th anniversary whilst working hard to manage and maintain ourselves and those who benefit from our work. It hardly seems possible, but this year sees us celebrating our 20th birthday. When we started at Heligan Gardens on 3rd June 1998, our aims were to role model to other businesses the benefits of employing someone with a learning disability, and to meet the needs of a group of individuals who had expressed a desire to work, in order to learn work and social skills to enable them to take control over their own lives. This was only going to be possible by letting people step out of their comfort zones, and by giving them real opportunities. The success of that policy is shown by having had over 150 people move on into education, independent living, relationships and work. We now have a non-profit making business, supplying many outlets with quality produce and products, as well as still selling over 80 veg bags fortnightly to local customers. The business is becoming much more secure and we are working hard to ensure it is not only self sustaining, but structured and planned for longevity. We have a lot of celebrations planned, and we hope all of those who have made People and Gardens possible through their support over the years will join us. On 2nd June, Bill and Lorraine are organising a dinner at Heligan Gardens. Some of our original participants, who were with us on the first day, will be working with the Heligan staff to harvest and cook a meal at Heligan. We have two open days at Watering Lane nursery on 5th and 6th June, and the Eden head chef Tony Trennery and the Eden apprentices will be cooking lunch for everyone who attends. Also planned is a trip to Switzerland to visit the International School of Zug and Luzern, who join us every year to volunteer, a trip to watch Somerset County Cricket, a visit to Manchester to watch United play, another restaurant takeover at Knightor, our annual cricket match at the St Austell Cricket Club against the Eden Project, and we have an Italian meal one summer evening in our lovely greenhouse, being arranged by Potluck Cornwall. As you can see there is a lot happening. Here’s to the next 20 years!! Last year we were delighted to be awarded a grant by The Big Lottery for our new project supporting our participants with ‘Assistive Technologies’. We are now able to use state of the art technology to improve participants’ cognitive abilities. This means our participants can make use of iPads to assist with day to day activities and also use this equipment to play fun games which have been proven to improve cognitive abilities. We have been challenged in our own technology with insufficient broadband at Watering Lane (this is being tackled, but taking some time). But in the meantime we have been able to set up the infrastructure for better technology on site. This includes new computer hardware, additional work stations, and the appointment of a sessional worker. The funding has also assisted the purchase of compost and seeds for additional growing. This is an exciting development for us, and quite a challenge considering our geographical area, but we are determined to succeed. We continue with our soft fruits project, which we grow in our fruit cage purchased following our successful Crowdfunder project. This useful system will also be used this year to train people outside of our project. It’s great that we can use some of our facilities to help others in the community. We also continue with our strawberry growing on raised beds, thanks to support from The Lost Gardens of Heligan. As we continue with this, we find we are learning all the time, as well as the system being a useful tool to grow other produce too, at a comfortable height. On the commercial side of our work we continue to gain customers to sell our produce to. At this time these are the P & G Veg Bag Customers: Heligan, Cornish Ketchup Co., Bad Boy Chilli Co., Knightor Restaurant, St Eval Candle Co., Tywardreath Village Shop, and Puddle Farm Shop. We have grown 50kg of hot chillies for Bad Boy Chilli Co., and they have asked us to grow more. Puddle Farm Shop is a new and exciting customer too, based in Lanlivery. There is little waste now with what we grow as we have developed an essential, varied, and valued customer base for our produce. Most importantly, our ties and value to the local community are growing, and our guys love meeting our lovely and varied business customers, and they love seeing them too! Food for Change is a programme funded by The European Social Fund, which we are delighted to be involved with. 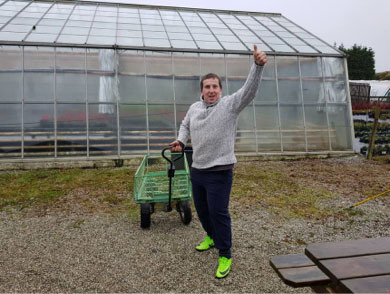 The programme works with people who are unemployed and not in education, enabling them to gain experience in food, growing, cooking, and trading. We’re one of twenty partners in Cornwall who provide the opportunities to do this. Currently we have four people coming to work and learn with us each week, with another one on their way. As well as learning how to grow food, we can also help people learn about trading food (including setting up micro businesses). We have instigated a network of producers and users with the sole intention of combatting food waste. It brings producers and users together when producers have a glut of produce or ‘ugly’ produce they cannot sell. This produce is given free to users rather than being composted. Food For Change participants have taken this on themselves, giving them great experience and self esteem. We are now going into our fourth season of growing for The Cornish Ketchup Co.. Currently we grow 200 tomato plants for them to use the tomatoes to make their delicious tomato ketchup. The variety we grow for them is called ‘Amish Paste’, a heritage variety know for its large size, great use for pastes and sauces, and most importantly its taste! Kris and Chris are so supportive of what we do, and we love working with them. Chris did a sponsored run recently and raised money for P and G. Thank you! 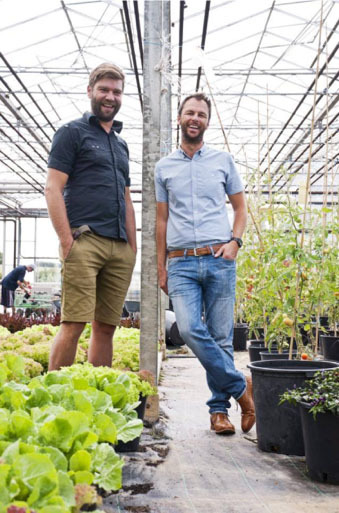 We managed to grab ten minutes with them both recently to ask a few questions about their delicious ketchup and how they came to work with People & Gardens. How did you first here about People & Gardens? We were first introduced to people and gardens by Ellie Michell from Barefoot Media. Ellie was at the time doing some volunteer work with People and Gardens and thought a collaboration might be of interest to us. Do you know how many tomatoes we have supplied you with over the years? I would guess we’ve had around 3000kg so far since we started. 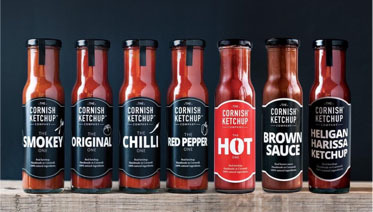 Can you tell us more about The Cornish Ketchup Company? Cornish ketchup is an all natural product handmade in Cornwall in small batches. It is sold throughout the UK. Being a natural product it has big flavour but with a much reduced sugar content to leading ketchup brands. Which is your favorite ketchup? My current favourite ketchup is the Hot One. It’s got a real chilli kick. And finally what do you love most about People & Gardens? We love the depth of care that embodies the very essence of People and Gardens. When we do get the chance to visit we are always met with smiles and there is always a good sense of fun and happiness. We have been so lucky to have the continued support of our volunteers, local people, community groups and local business. We are able to run our project because of all your support and the time you so generously give to us, thank you. Everything from bag packing at Tesco, volunteers speaking at local community groups, website support and our veg bag customers. And finally if you would like to sign up to our fortnightly veg bag more information is here www.peopleandgardens.co.uk/veg-bags.